After almost feeling like a real author the previous week, the last 5 days were a bit like " the day after the lord mayors show". I had bookings for Tuesday and Friday, but with not much else in between. Monday was International Womens Day, and so I decided to take a day off and head out to the countryside with Yulia, before returning home for a rather large tea with the girls. I have realised that, when there are people in the house it is almost impossible to focus on writing - as I am easily distracted. It would be nice to have a shed at the bottom of the garden just like Roald Dahl where I could hide for the day with a flask of tea and a pouch of tobacco, but I suppose I am just going to have to wait. Lynne had arranged for me to return to Blackpool on Tuesday morning for several readings throughout the day. The first was at Boundary Library where I read to two schools, and received praise from the teachers and kids....( it goes without saying that Golden Arm was unanimously requested for an encore - with The Hairy Plug Monster hardly getting a look in when Lynne held a ballot amongst the pupils). We made our way across town to Bispham Library where we managed to cram another two classes into the children's section and gave another hours performance before taking lunch. It was fun working with Lynne as I realised that over the course of the two days, we had developed an understanding which meant that the performances had strong continuity and the pauses were not too long. She was also able to advise when my voice became too quiet or was lost amongst the high ceilings. Following on from a prawn cocktail we then moved across to the newly built, state of the art Devonshire Primary School, which is possibly the "coolest school" I have ever been to. Huge wide corridors, minimalist design, rooftop gardens and playgrounds, hexagonal assembly halls and an inspirational library all made for a memorable visit. We were performing in the "Studio" where they even had a story-telling chair. At first I said I need to earn the right to sit in it, and needless to say, the kids demanded that I sat in the chair after entertaining them for half an hour- before scaring them senseless. Raaaaaaaaagh!!!! 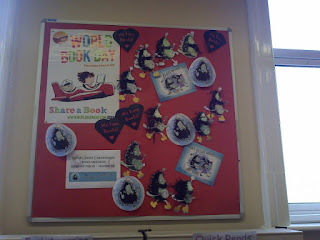 The day came to a close with a reading at the Revoe Library, where they even had worked on a collage of Hairy Plug Monsters to promote the reading to a small group of older children as part of the after school "Chatterbooks" club. The Hairy Plug Monster learns Telesales.